Hey! Did you hear that it’s Nutrition Month yet? Maybe you have been blasted all over social media with tons of posts so you already know. If you didn’t know….well…March is Nutrition Month! A Dietitian’s goal every day is to teach people about healthy eating, but Nutrition Month is like our Christmas. We get extra creative and extra loud because we can share our experiences, our knowledge, our tips and tricks and maybe even some of our failures! This year the theme is Unlock the Potential of Food. Simply put…food has limitless potential. Its about so much more than satisfying our hunger! For the purposes of this blog though, I would like to focus in on food’s potential to heal. Celiac Disease is an auto immune disease that can cause damage to the small intestine when Gluten is consumed. This damage can lead to nutrient deficiencies which can cause further health complications down the line. Gluten is found in wheat, rye, barley and their hybrid strains. I often hear…”Have you tried gluten free? We’ve gone gluten free.” as I’m walking through the grocery store or just doing things like standing in line for coffee. I find that there is absolutely nothing wrong with this statement or with the actual act of going gluten free itself. I only ask that people are cautious when it comes to changing their diet. I have heard people say that going gluten free really helped them. Hey…I can’t argue with that! The one thing I ask though, is that you make sure you have ruled out potential health considerations before changing something that might not be helpful. The Gluten-free diet itself isn’t necessarily a healthy one. Gluten-free foods are not fortified with the same nutrients and they tend to be higher in fat and sugar than their gluten containing counterparts. 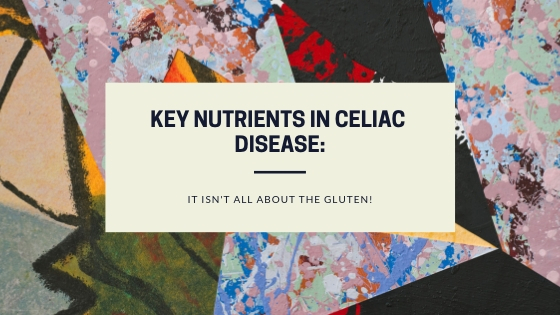 Individuals who have Celiac might also have many nutrients deficiencies from years of damage to their intestines and they are also susceptible to other autoimmune diseases as well as other health complications in general. That is why it’s extremely important to get the proper diagnosis. The proper diagnosis means proper follow-up throughout your life span. your first degree relatives have a 10-15% increased chance of having this disease. Your proper diagnosis will help your family members and potential future children as well. You’re not the only one affected. you must remain on a gluten free diet for life. This is currently the only treatment. This means no cheating at restaurants and special occasions. Consuming gluten can do real damage to your intestines which can lead to other health issues down the line. The more times you “Cheat” on your gluten free diet, the higher your chances of developing another autoimmune disease like Diabetes or Thyroid Disease. you are at a higher risk of developing some cancers, osteoporosis, infertility and some nutrient deficiencies. These chances become more likely if you continue to eat gluten or “cheat” on your diet. you need to talk to a Dietitian. The gluten free diet on its own is not complete and its important to fill in the gaps and find out what nutrients are important to keep you strong and healthy and living your best life. This is where I wanted this blog to lead. Having Celiac Disease and being on a Gluten free diet means there are certain nutritional considerations you need to be aware of, both at diagnosis and long term. Iron deficiency can be an issue at diagnosis but also potentially throughout the lifespan. For some people this was the only symptom that indicated Celiac disease. Women have a higher risk of developing iron deficiency as they tend to lose more blood than their male counterparts. You should monitor these levels as they can pinpoint a flare-up or accidental ingestion of gluten long term. Its important to note that one accidental exposure will not cause enough damage to cause deficiencies, we are more worried about repeated exposure over time. To increase your iron stores or keep them up long term, focus on iron rich foods. Heme iron is very well absorbed in the body. Its found in meat, fish and poultry. The levels of these nutrients should increase as healing progresses. Gluten containing foods are often fortified with these nutrients but the same cannot be said for gluten-free foods. Your doctor should monitor these levels if a flare up occurs. Folate is particularly important for pregnant woman as it can help prevent neural tube defects. If levels do not increase with food consumption supplementation maybe necessary. Lactose intolerance is common in newly diagnosed patients but tolerance usually returns as the gut heals. There is no need to avoid dairy however, you can simply just choose the many lactose-free options that are widely available. Calcium and Vitamin D status is often low at diagnosis and throughout. This is probably due to multiple factors including malabsorption from years of waiting for a diagnosis and decreased intake of dairy because it causes unpleasant symptoms due to intestinal damage. Bone density can also be affected so its important to insure that your doctor has this on his/her radar! The gluten free diet is notoriously low in fibre and high in sugar. The recommended intake of daily fibre is 21-38 grams per day. Make sure you increase intake slowly and add additional fluids, preferably water. The gluten free diet can be high in unhealthy fats. Excess fat is often used to improve the texture of gluten free foods. If you are purchasing a lot of pre-packaged baked goods, cookies, and granola bars then this is something you need to be concerned about. So there you have it. I want to emphasize again that its extremely important to get your Celiac Diagnosis because of the above nutrition implications. If you are experiementing with a Gluten-free diet or cutting other things out of your diet…always remember…if you take something out, add something in…otherwise you might be missing some key nutrients! Check out www.celiac.ca for tons of great information! Hope that helps! Happy Nutrition Month everyone!